The Outdoor Revolution Movelite T2 Drive-Away Air Awning in Lowline connection height is an ideal fit for VW Transporters. 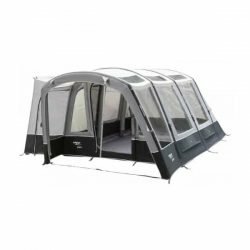 This quick inflation drive away awning is packed with features including an inflatable side brow canopy and a zip-on front canopy (optional extra) can also be added to form a weatherproof front porch. The awning has a main front entrance, doors each side and doors in the connection tunnel which can be used to access your van without disturbing occupants in the awning. All windows and doors in the awning have curtains and the doors also have mosquito mesh. The awning tunnel is height adjustable between 180cm and 210cm and has a triangular roof window each side to create a bright usable space. 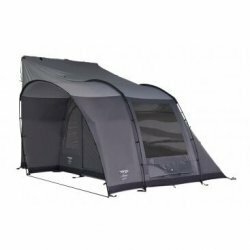 The internal height of 205cm along with shaped air frame tubes offers great headroom with usable space right up to the sides of the awning. The 2018 model has linked in attachment points on the AirFrame to attach the Lumi Link Lighting system and other accessories. – Lifetime guarantee on the tubes in air-frame.